The capability to retract a conveyor, either manually or pneumatically, can improve system flexibility. The basic design of a retracting tail is a conveyor frame that retracts or extends, typically on slides or rails. Not all products are fit to be sold. Products can be rejected by sight for reasons such as an irregularity or deformity, or they may fail a safety test such as metal detection. It is then necessary to remove the products from the production line. A retracting tail allows the rejected product to drop onto another conveyor or into a bin to be taken away. Sometimes, product needs to be placed onto another conveyor or a tray in precise rows or columns. 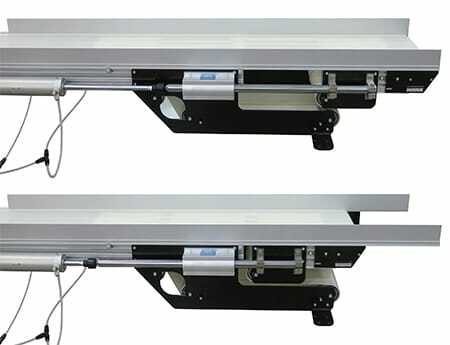 In the video above, the retract conveyor is equipped with sensors that ensure the product is placed exactly where it needs to be on the trays below. A retracting conveyor can be used to route products to multiple lines. For the conveyor above, the product was being routed down the retracting conveyor and then dropped onto one of three lines depending on how far the conveyor was extended. Often done with a manual retract, a retracting tail can create a walk-through for workers in a plant to access an area that is blocked by machinery. This provides a safer option that trying to move under or over equipment. Another option to create a walk though is a lift gate conveyor. Learn more about Dorner’s Custom Conveyor Solutions.